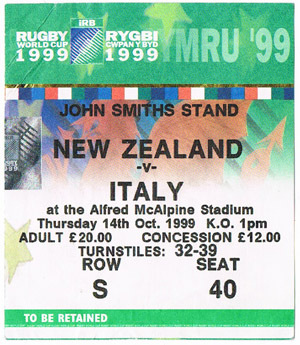 This post is my entry in Hadyn’s Field Theory: Rugby World Cup stories competition. I’m unsure what category ‘smart arse behaves immaturely at world cup’ fits into, but here we go. I *did* warn him my entry would be largely about getting shitfaced. This was the 1999 world cup of John Hart, new jersies and All Black front-row painted jumbo jets, not to mention hubris, over-confidence and pride before a fall. I was living in London at the time and had the ‘pool pack’ of tickets for NZ v Tonga in Bristol, the match versus England at Twickenham and NZ v Italy up at Huddersfield. We were a group of five chaps, mostly from Hamilton, all fans of rugby, travelling, drinking and average behavior. The match against Italy was a jumping off point for a couple of days away in northern cities. Our bus from London took us along some of the most boring, scenery-free motorways known to man to Huddersfield in West Yorkshire. Alfred McAlpine Stadium is a charming stadium, situated in the middle of a charming business park – you sit nice and close to the action, and we cheered and carried on as the All Blacks racked up 101 points to poor old Italy’s 3. Cullen, Lomu and Osborne ran riot – even Dylan Mika got on the scoresheet. 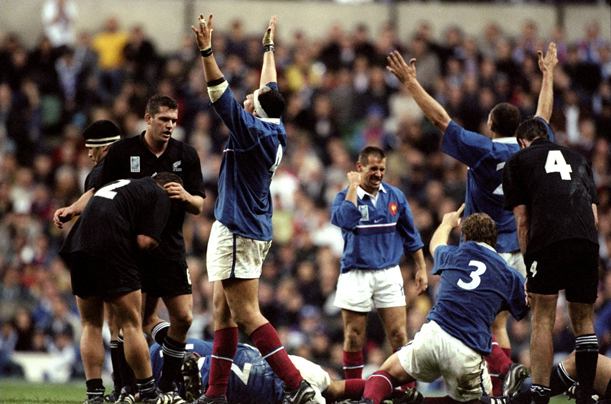 It was arguably the peak of the All Blacks’ 1999 campaign – next up was a lackluster quarter final against Scotland and THAT match versus the French. Anyway. Rugby is not really the point of *this* story. Our little group moved straight out of the stadium to the business park tavern to watch Wales v Samoa on the telly. This was the accumulation period, in cricket terms, where a solid base of fizzy lager pints was laid down, while cheering the Samoans on to their second win world cup win against the Welsh. We weren’t feeling much pain at full time, and it was just a quick stagger to the bus to the train station, stopping only for a quick photo-op with a passing Glen Osborne. The blogger with Glen Osborne. Companion’s identify concealed to protect the drunk. I soon found myself wandering alone around a Huddersfield train platform, having lost my companions for a while – they were in the station McDonalds loading up before the night ahead, they told me much later (Cheers! You bastards). Having regrouped, we boarded a train bound for Leeds. This being the UK, it was dark when we got there, and we were soon slipping down Leedside streets fruitlessly looking for a pub – on the way we spotted a huge, flash-looking bus outside a flash hotel. “Wouldn’t it be awesome if that was the All Blacks’ team bus?”someone said. Cue Twilight Zone theme. We ended up in the Leeds equivalent of a Lone Star, thoughtfully offering a two-for-one happy hour, where more accumulation ensued. From there it was on to a dodgy nightclub, an upstairs, no-windowed affair. Our group was busy being loud witty in a fashion you can only be after 16 pints of lager, when we noticed a group of improbably wide-shouldered guys in matching polo shirts and pleated pants making their way in – it was only the bloody All Blacks! Imagine their surprise, having carefully chosen accommodation away from Huddersfield and getting out to a wee nightclub to unwind away from the glare of a rugby mad public, to see us in our All Black gears with a slurry welcome. We bowled over to the group of seven or eight players, seemingly lead by Josh Kronfeld and Jeff Wilson, to say g’day. Kronfeld was the friendliest, happy to pose for photos and accept any drinks on offer. Wilson was happy to talk, but seemed to have trouble relaxing, weirdly answering any questions as talking to a post match interviewer. I made a great faux pas, asking Greg Feek, who towered over me by about seven feet, who he was. “Greg Feek,” he said helpfully but sternly, before stalking away. I was pretty impressed with some of the All Blacks players’ own accumulation, considering this was the middle of the world cup. If you remember, John Hart took the team away to the south of France (the next day, as it turns out) for ‘frolicking in the surf’ photo ops before heading to Scotland for the quarter final. 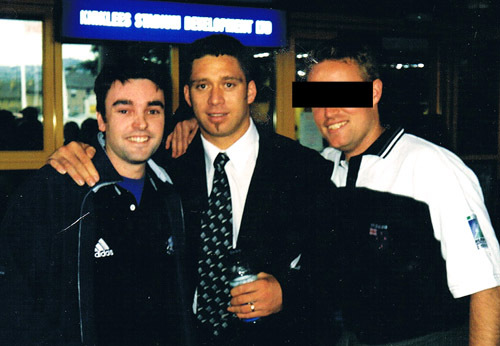 I can’t remember if we left first, or them, but we were soon on our way – I remember thinking “Won’t it be great when we get home to New Zealand, we can say we were on the piss with the All Blacks when they won the 1999 world cup!” Ahem. From there, we were back to Leeds station, to get the last train to Manchester, where we were staying. Just to add to the surreality of it all, we found ourselves sharing the lift up to our hotel rooms with Begbie himself, Robert Carlisle, and two lady-friends. “You’re Robert Carlisle!” I said. “No I’m not,” he said. It bloody was, you know. This was the first of a three-day tour up north – from Manchester we went to Newcastle (“Hey, we’re over here from New Zealand, do you know our long lost cousin – his name is Alan Shearer?”) then Edinburgh (“I know, let’s spend the day in this ancient city having a head-to-head drinking championship of the world!”). It was a lot of fun. More fun than the rugby.